The green cosmetics industry is booming, projected to top $13 billion globally by 2018. The Atlanta market is no exception, even though eco products tend to cost more and have a shorter shelf life. “Many people are sensitive to toxic ingredients, so it’s worth the splurge to spend more on makeup that’s free of synthetic preservatives and chemicals,” says Dr. Taz Bhatia, founder and medical director of the Atlanta Center for Holistic and Integrative Medicine. 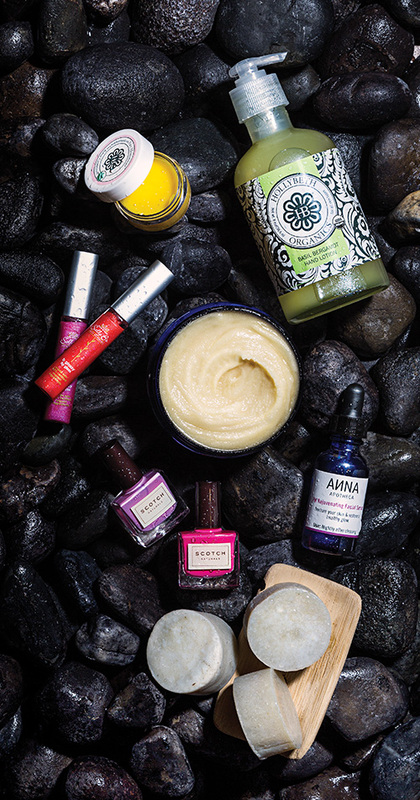 Here, five local spots to get your green beauty fix. Founder Anna Russ is a former biotech professional who turned into a devoted practitioner of Ayurveda, a traditional Hindu health system based on holistic balance. Launched in May and sold online, her products include body oils, facial toners, and teas. Georgia’s only USDA-certified organic skincare line was founded in 2008 by HollyBeth Anderson, who first learned about the healing power of plants on walks with her grandmother in the Georgia woods. The brand’s body products are sold online and in shops around the world.